"Houston, I've fallen and I can't get up!" 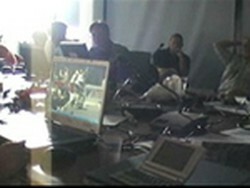 2006 HMP Lunar Medical Contingency Simulation live simulcast in real-time between the HMP RS and mission controllers in Houston, Montreal, and Strasbourg. 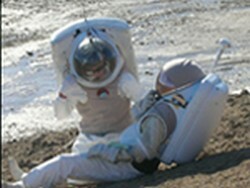 In summary, the 2006 HMP Lunar Medical Contingency Simulation demonstrated that an injured suited crewmember could be safely extracted from difficult terrain, similar to what might be expected in a lunar EVA, and transported to a remote site for diagnostic and therapeutic care. A number of issues developed unexpectedly during the sim that challenged the crew and sim planners. 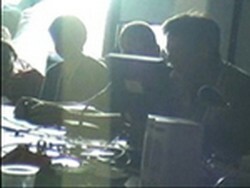 However, the team was able to complete the mission, which involved real-time communications and coordination between members of the Exploration Payload Operations Center at NASA-Johnson Space Center (ExPOC), International Space University (ISU) in Strasbourg, France, and the Payload Tele-Operations Center (PTOC) in Montreal, Canada. 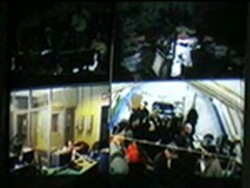 Demonstrate the ability to coordinate between multiple control centers (in this case Houston, Montreal, Strasbourg), the CEV (Crew Exploration Vehicle, in this case astronauts on-bord the International Space Station), and the EVA crew while conducting EVA operations on an extra-planetary surface. Develop effective management strategy for a planetary EVA medical/field contingency. Demonstrate the ability to conduct field (possibly high-angle) rescue operations for an incapacitated EVA crewmember on an extra-planetary surface. 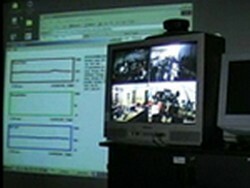 Demonstrate the ability to conduct remote patient medical diagnosis of an ill/injured EVA crewmember using telemedicine (including ultrasound) techniques. Students to have interactive role functioning as back room flight controllers for EVA, ECLS, Surgeon and SRAG - with responsibilities to work issues real-time with the ExPOC (Houston) - designated front room controllers. 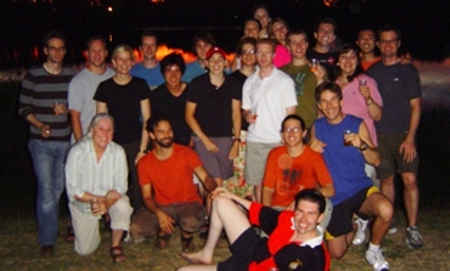 In addition to those organizations mentioned above, coordination and implementation of the exercise on Devon Island was carried out by participants from Simon Fraser University, Hamilton-Sundstrand, Virginia Commonwealth University, University of Colorado (Boulder), Rocky Mountain Rescue, the Canadian Space Agency, NASA-Johnson Space Center, NASA-Ames Research Center and Mars Institute. EVA Med Evac Sim HMP RS 2006 Back Room Medical Support Led by Dr. Jeffrey Jones NASA ISU SSP06 Life Sciences Strasbourg, France 2006. Photos Sarah Jane Pell. Rick Scheuring and Pascal Lee EVA crew simulating accident and emergency response, Houghton Mars Project in Canada. Photo Nikki Wilkinson. The Haughton-Mars Project (HMP) is an international interdisciplinary field research project centered on the scientific study of the Haughton impact structure and surrounding terrain, Devon Island, High Arctic, viewed as a terrestrial analog for the Mars. The rocky polar desert setting, geologic features and biological attributes of the site offer unique insights into the possible evolution of Mars - in particular the history of water and of past climates on Mars - the effects of impacts on Earth and on other planets, and the possibilities and limits of life in extreme environments. In parallel with its Science program, the HMP supports an Exploration program aimed at developing new technologies, strategies, humans factors experience, and field-based operational know-how key to planning the future exploration of the Moon, Mars and other planets by robots and humans. The HMP is managed and operated by the Mars Institute with support from the SETI Institute. "A human mission to Mars might be 30 years away or more, but one day it will happen," said Pascal Lee, 43, the NASA astronomer who first visited this place a decade ago and supervises the Haughton-Mars Project, as the program is known. "The fundamental lessons we are learning here need to be learned now. On the moon and Mars, it's going to be all about fieldwork, geology, reconnaissance, resource assessment, traversing vast tracts of territory--all of this stuff we do on a daily basis here."